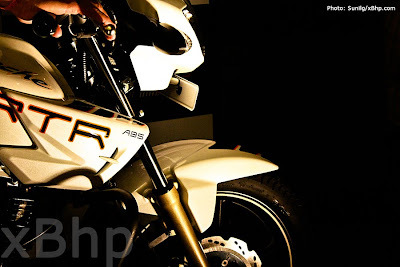 India's premium motorcycle community XBhp.com was at the launch of the TVS Apach RTR 180 ABS official launch and has brought us the coverage in immaculate details. This is for the first time an Indian manufacturer has attempted such a technology and in it's very first go, TVS has managed to pull of the feat quite impressively. The ABS system, developed in conglomeration with Continental, is a non-linked type ABS with the front and rear wheel doing individual speed sensing and wheel lock monitoring. The H-ECU or the Hydraulic Electronic Control Unit is the heart of the system, which constantly keeps monitoring the front and rear wheel dynamics through the individual sensors on each wheel. To make matters even more controlled and that way stable, the Apache RTR 180 ABS is also equipped with RLP (Rear wheel Lift-off Protection) system, which essentially monitors the deceleration dynamics when the rear wheel is likely to lift off during hard braking and takes over the control without any compromise to the braking distance. The RLP system working along side the ABS system ensures that the rider gets the most comfortable braking experience while riding the Apache. Well, for a rider who wants to just enjoy the riding, ABS does come as a great boon in motorcycle technology. But can that be said, when the rider wants to have fun more than just riding. What about those stoppies and endos?? Well, that's were the thinking cap clad technicians have walked that extra mile. The TVS Apache RTR 180 ABS comes with a toggle "ABS Off" button on the dash board, which can be used to turn off the system so that the rider can explore the hidden capabilities under controlled conditions. To take matters ahead and leave nothing lagging, TVS has also implemented 3-phase DC lighting and efficient energy management system. We have been closely working with our technology partner, the international automotive supplier, Continental and what you see is the result of more than a year’s collaborative work. Having first showcased ABS technology in a motorcycle in India, as a concept in the Auto-expo in New Delhi last year, we are proud that this concept has become a reality. ABS technology prevents skidding and assists effective braking, especially in wet and muddy road conditions while providing for sharper and shorter cornering. Well, truly speaking I'm really amazed and excited to see someone speaking of handling and cornering performance of a motorcycle during a launch of a motorcycle in India. Else, most of the speeches are directed towards collaboration and sales. Times are really changing. 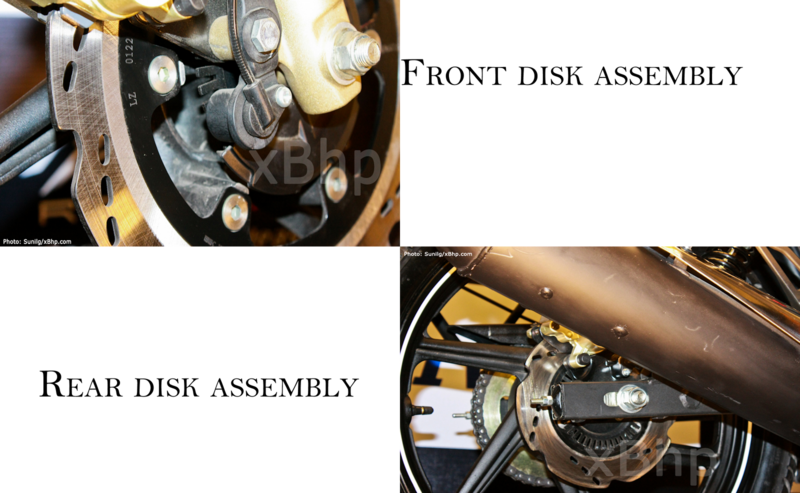 With this new, compact motorcycle Antilock Braking System (ABS), which has been developed by Continental’s Chassis & Safety Division in collaboration with TVS Motor Company, we have further strengthened our presence as a strong international supplier in the Indian automotive industry. ABS for motorcycles emphasizes our philosophy of ‘Intelligent mobility and safety for everyone’. It is a vital and decisive step on the road towards “Vision Zero,” when safety is evolved to such a level that there are no more serious accidents on the road. In view of globally available technologies, safety is non-negotiable. It is gratifying for Continental that we have associated with an Indian manufacturer to give India her first motorcycle with ABS technology. Those are impressive numbers in any standards, and more so in Indian conditions, these numbers are excellent. What's even more excellent is that the Ex-showroom price has been kept at ₹ 78,880. Pricey, I think not Sir, as it's an optimum price for the rider's safety. 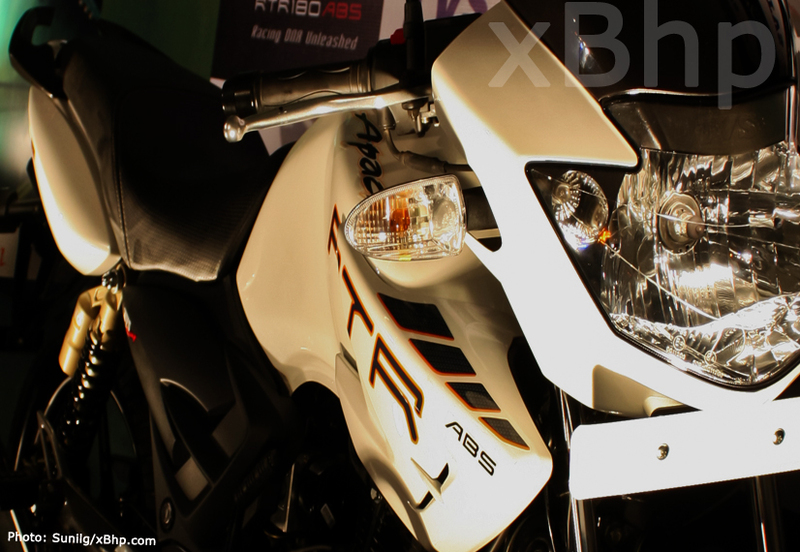 The engine performance remains the same on both the ABS and the non-ABS version of the RTR 180. There's not a single feather of doubt that TVS has become the blade runner for bringing such a wonderful technology to lower capacity motorcycles. But as a motorcycle enthusiast, I would be keeping an eye on the maintainability and reliability of the ABS system, because that would become paramount for anyone who buys this bike, because any lapse by the system might prove to be fatal given a bad situation.